Was this person insane? Of course not even Potbelly. The oatmeal-chocolate-chip cookie at Potbelly is an oversized, underbaked work of pastry genius, one of the most addictive, satisfying, delicious cookies any restaurant—chain or not—has ever offered. But if you eat it weekly for seven years, as I have, it gets a little old. Which is why I took a little hiatus. And when that hiatus was over, I returned to Potbelly only to be slapped in the face. The chain had expanded its cookie line by 66 percent, and nobody had told me. I barely paid attention to the new 100-calorie packs of mini cherry oatmeal cookies. (Nobody wants a cherry oatmeal cookie when chocolate oatmeal cookies are within reach.) Instead, I homed in on the chocolate brownie cookie. 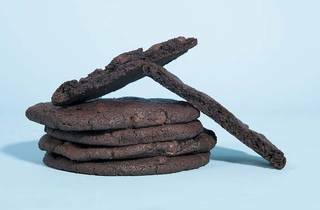 It was soft (softer still toward the middle, the signature Potbelly touch), and the depth of cocoa flavor matched the cookie’s dark-as-night, almost-black appearance. 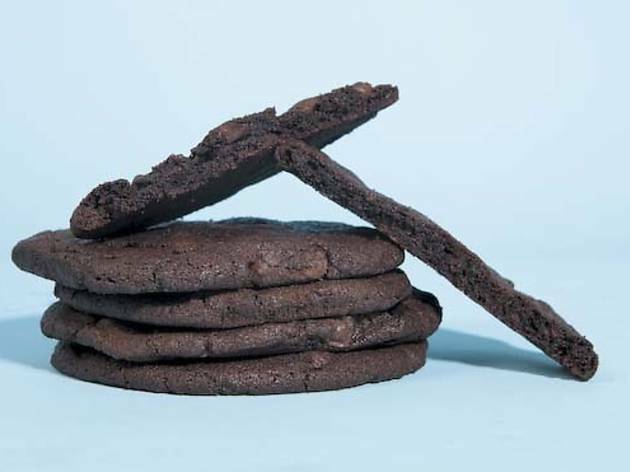 Most notable about the cookie was what it reminded me of: a chocolate cookie I once ate at Momofuku Milk Bar, the New York bakery food obsessives most obsess over. There were some differences, of course. Potbelly’s version was less greasy. And at $1.15, it cost about half the price. Most important: I needed only travel around the corner to get one. Locations around the city (potbelly.com).